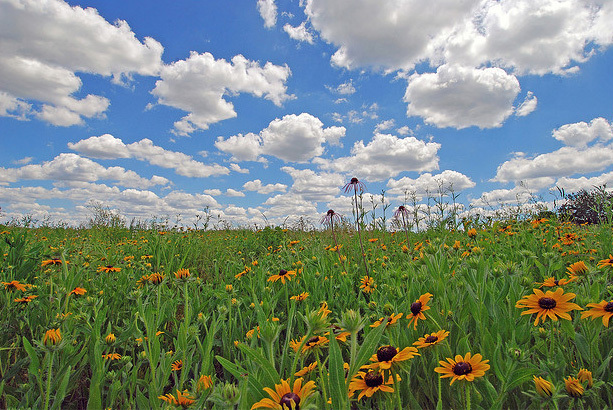 Restored prairie in McLean County, Illinois; photo by Tim (tlindenbaum) on Flickr (noncommercial use permitted with attribution / no derivative works). The North American prairie is one of the most endangered ecosystems on earth. The grasslands of North America began to form about 20 million years ago, but in some areas up to 99 percent of the prairie has been destroyed (in just the last 125-150 years). Illinois also designates an official state prairie grass. Wildflowers are the jewels of public lands; tread lightly, take only photos and memories - do not pick flowers or dig up native grasses or other plants.